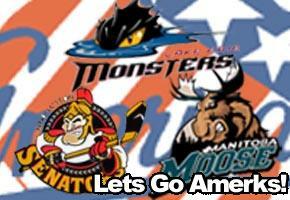 Amerks Gear Up For Another Busy Week · Let's Go Amerks! Even a holiday weekend wont stop the Rochester Americans from having a three game in three day schedule.Â As with the rest of the season, the Amerks don’t catch a break for anything.Â There three game stint for this week starts on Wednesday. On Thanksgiving Eve, the Americans take on the Manitoba Moose in a heated divisional matchup at home.Â They haven’t had a regulation win against the Manitoba Moose in seven games dating back to the 2006-07 season.Â This is their chance to show the number two team in the Northern Division what they are made of. Wednesday’s game starts at 7:05 p.m. at the Blue Cross Arena.Â The game is a Clevermethod Business Persons’ Night.Â Fans can bring their businesscards to the box office and get $11 off a $21 ticket to the game.Â It is also all a night where all Rochester area school children, teachers, administrators, school employees and families are invited to attend the Wednesday evening contest at special ticket prices. Contact Tom Winslow at 454-5335 ext. 3005 for more information. On Thanksgiving, the Amerks take their first trip of the season south to take on the Binghamton Senators.Â In their last meeting here in Rochester, the Amerks lost a heart breaker in the third period 5-4.Â This game will be the second of eight the two teams will have against each other.Â The game starts at 6:05 p.m. and will also be broadcast live on Hot Talk 1280 WHTK, whtk.com and B2 networks. On Friday, the team travels back home for their first game ever against the Lake Erie Monsters.Â This new team is the farm team for the Colorado Avalanche.Â This is the first of six games the two teams will play this season.Â The game starts and 7:35 p.m. and will once again will be broadcast live on Hot Talk 1280 WHTK, whtk.com and B2 networks. The game will also be televised live on Time Warner SportsNet Rochester Channel 26.